Make the most of your time in port in Seattle with this private tour of the city's must-see highlights including the Space Needle, Pike Place Market, Pioneer Square, the Ballard Locks and Queen Anne Hill. Visit local art galleries, sip coffee at the original Starbucks, and whiz up to the top of the Space Needle if you wish for incredible 360-degree views of Puget Sound, Mt Rainier and the Olympic Mountains. You'll learn all about the history of Seattle from your guide as you travel by van, making stops along the way to explore by foot and discover the best in food, shopping and entertainment. 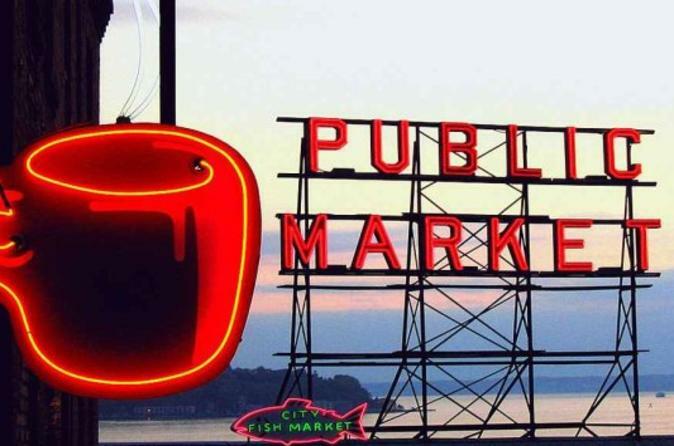 By the end of this private shore excursion, you’ll know Seattle like a local! When you dock at the Seattle cruise port, you'll be picked up by your friendly, knowledgeable guide for a private Seattle sightseeing tour. Learn about the the city's history, culture, landscape and architecture as you ride through the city by van, making stops at must-see attractions to walk around and soak up the atmosphere. After driving through Chinatown-International District, stop in the historic neighborhood of Pioneer Square, which was once the heart of the city when Seattle's founders settled here in 1852. Wander past charming boutiques, quirky shops and lovely cafes as your guide explains the significance of the Renaissance Revival architecture. Continue to Belltown, the city’s most populated neighborhood, where you'll spend time exploring world-famous Pike Place Market, Seattle's original farmers market. Soak up the buzzing atmosphere as you peruse the many vendors offering everything from locally sourced produce and artisanal foods to unique souvenirs, used books and cultural relics. Don't miss the famous 'flying fish'! Across the street, you can grab a coffee at the original Starbucks and pop into some local art galleries. Hop back in the car and drive north to the iconic Space Needle, where you'll have time to hop out, purchase an admission ticket, and whiz up to the top-floor observatory to enjoy jaw-dropping panoramic views of the Seattle skyline, Puget Sound, Mt Rainier, the Cascade Mountains and the Olympic Mountains. After taking in this unforgettable vista, your guide will take you to the hilltop neighborhood of Queen Anne Hill, where you can enjoy more city views from the lookout point. Continue to the west end of Salmon Bay to visit the Ballard Locks (known formally as the Hiram M Chittenden Locks), which links Puget Sound with Lake Union and Lake Washington. Your guide will explain the engineering feats behind this complex of locks and point out the famous fish ladder, where salmon pass between fresh water and salt water. Other sights include Safeco Stadium, CenturyLink Field, Olympic Sculpture Park, Fisherman's Terminal and the Elliot Bay Waterfront. By the end of the day, you’ll feel like a Seattle native! You'll be driven back to the cruise port at the end of your tour. Worry-free Shore Excursion: We will ensure your timely return to the Seattle port for this activity. In the rare event your ship has departed, we will arrange for transportation to the next port-of- call. If your ship is delayed and you are unable to attend this activity, your money will be refunded. See our terms and conditions for full details.